Chakra Reading Cards is a gorgeous, vibrant chakra-based deck by Rachelle Charman and Rockpool Publishing. The 36 cards measure 3 3/4" x 5 1/2". They are large, but flexible enough to shuffle vertically. They have a nice glossy finish. The back design is not reversible, but the cards are not meant to be used with reversals. The backs are beautiful, featuring rainbow colors fading into each other down the length of the card, corresponding with the seven chakra symbols. The Earth Star and Soul Star chakra symbols are to the left and right of the middle Heart chakra symbol. The cards and book are housed in a very nice, sturdy box that closes magnetically. The cards sit in a recessed cardboard insert, and the book lays on top. I have several Rockpool decks and have had a different experience with each of the inserts. This one is cardboard, like the one in the Flower Reading Cards, but thankfully the cards in this deck don't get caught underneath like they do with the Flower ones. However, I do have to flip the box over to release the cards, as there is no indentation for your finger to pull them out. My favorite Rockpool inserts are the plastic ones with the indentation for your finger, as those are the easiest way to slide the cards out (the Chinese Fortune Reading Cards and Angel Reading Cards have those). The deck is divided into nine chakras, with four cards in each chakra "suit". I absolutely love that in addition to the traditional seven chakras (Base (Root), Sacral, Solar Plexus, Heart, Throat, Third Eye and Crown), the deck also includes the Earth Star Chakra and the Soul Star Chakra. This really made the deck that much more interesting to me. It is difficult to tell the difference between the Yellow (Solar Plexus) and Gold (Soul Star) borders. And the Red (Base) and Orange (Sacral) colors are also very similar. I wish these colors had been more dramatically different, so that it was obvious at first glance which cards belonged to which chakras. Also, the Indigo (Third Eye) is more of a dark blue, and it would have been nice if it was more purple. All that being said, I do like that the borders are different colors, according to their chakras. I thought this was a really great design decision. The image designs vary in medium. There are paintings, computer generated imagery and manipulated photography. But rather than feeling distracting or chaotic, the cards blend together beautifully in a reading. The colors used in the images are so vibrant. The imagery feels alive with energy, which you can feel whenever you turn over a card. The cards are so beautiful, you just want to get lost in them for a good long while. Most of the cards are simple, yet evocative and powerful. One of the ways I used this deck was as part of a chakra reading. Shocking, I know! I drew a card (from another deck) for each of the nine chakras, to tell me the current status of each of my chakras. Then I drew a card from this deck, for each of the chakras, for what energy was needed to balance the chakras. It was interesting, the idea of using one chakra's energy to heal another. Out of nine chakras, only one card fell in its natural chakra position. (I drew a card from the Crown suit to apply to the Crown position in the spread.) It made for a very thought provoking reading. It gave me a lot to chew on and a lot of practical advice to apply. During the 10-day period I worked with this deck daily, I drew cards from each chakra except the Sacral chakra and Earth Star chakra. But I did draw a Sacral card in my chakra reading. So the only chakra suit I did not get to work with was the Earth Star chakra, which was a bummer because I was excited about exploring that one. I will continue working with the cards, and will eventually draw one of those, it just wasn't in time for this review. I drew three different Third Eye cards, three days in a row, which was interesting. And one of those cards also appeared in my chakra reading. The first card I drew from the deck was Soul Healing (Soul Star Chakra). There couldn't have been a better card, from any deck, to come up for me that day. I had a painful falling out with a dear loved one and my soul was in deep, desperate need of healing. The passage from the book seemed to be talking directly to me. The next day I drew Divine Wisdom (another Soul Star Chakra card). Again, it was exactly what I needed to hear that day, when I was debating a decision, reminding me to trust in my inner wisdom. It's interesting to me that I had two instances of a chakra repeating itself from one day to the next. It was fascinating to see when the energy was sticking around. This would be a fantastic deck to have on hand to keep track of the ebb and flow of the energy getting caught up in your different chakras. One day I asked what chakra imbalance was causing my tooth pain issue, and I drew Forgiveness (Heart Chakra). In the book, I read this: "When we hold onto grudges and wounds from the past we can create imbalance and disharmony in out life. Over time this can turn into resentment, anger, frustration, sickness and depression, like rotting fruit creating a disease inside us." That just hit the nail on the head for me. I found it interesting that my tooth issues could be a heart chakra issue, and not a throat chakra issue (where the mouth is located). Another day, I drew the Abundance card (Root Chakra) and I made an unexpected sale that day. On a day that I drew Communication (Throat Chakra), I spent a really nice evening out with my youngest daughter, enabling us to talk one-on-one. The last day I drew from this deck, I pulled the Spiritual Awakening card (Crown Chakra) and I was like YES! Because I had literally had a spiritual epiphany that morning, and everything the book said related directly to my issue. It was perfect. So I can attest that the cards read really well. There wasn't an instance where I was scratching my head, wondering what it meant for me. The messages were always clear and on point. Next there is a diagram with the outline of a person sitting down, with all the chakras lined up along the body, indicating which goes where. There is one page titled Introduction to Chakras. Each of the chakras is divided into its own section, beginning with a 2-page background on the chakra. This background gives the name of the chakra, the associated color(s) and location on the body/area. It goes into detail on what attributes the chakra has, how it relates to your body/life, and what it feels like when the chakra is balanced. There are several bulleted keywords and phrases that each chakra relates to. The second page of each chakra introduction provides exercises (rituals with meditation and crystals) for you to cleanse and balance the chakra. This is followed by an affirmation. So when you feel one of your chakras are unbalanced, you can refer to this section and perform the ritual and get back on track. The book is beautiful. On each 2-page chakra introduction, the tops of the pages are painted with uneven watercolor that has an absolutely stunning effect. This is such a simple thing, but it had such a big impact on the aesthetic of the book. And then when you turn to the individual card meaning pages, along the edge of all of the right pages are these curved pointy designs, reminiscent of mandala edging. This colored edging makes flipping through the book and finding a particular chakra easy. Again, another small detail, yet really pleasing to the eye. In addition, on the top of the right side of each meaning page is each chakra symbol. And the watercolor, edging and symbols for each chakra are in each of the chakra's individual colors. There was a lot of care, beauty and attention to detail put into the book. Each card gets a 2-page spread. On the left side is simply a full-color image of the card, almost life-size. On the right side is the chakra symbol, card number, title and chakra. The meaning of the card takes up the rest of the page. At the bottom is an affirmation. The meanings are wonderful. They give you not only philosophical points to consider, but also practical suggestions on how to strengthen the particular area of the chakra you drew. Every time I drew a card, the meaning given applied to my situation perfectly. The book ends with an About the Author page, followed by a 2-page photo of the author at an altar. The last three pages are ads for other offerings by the author and publisher. The images in this deck are so powerful and evocative. The colors are vibrant and energetic. It's a visual treat for your eyes. It is the prettiest chakra deck I have seen, and a must-have for chakra work. The cards speak powerfully, read like a dream, and the messages are always on point. It's a deck I most definitely highly recommend. I still have a hard time distinguishing the differences between the Soul Star Chakra and the Crown Chakra, and also between the Earth Star Chakra and the Base (Root) Chakra. The two pairs seem very similar to me, addressing many similar issues. I will have to do more research to make the distinctions clearer to myself, as this deck has really made me want to always incorporate the nine chakras into my work, instead of the usual seven. 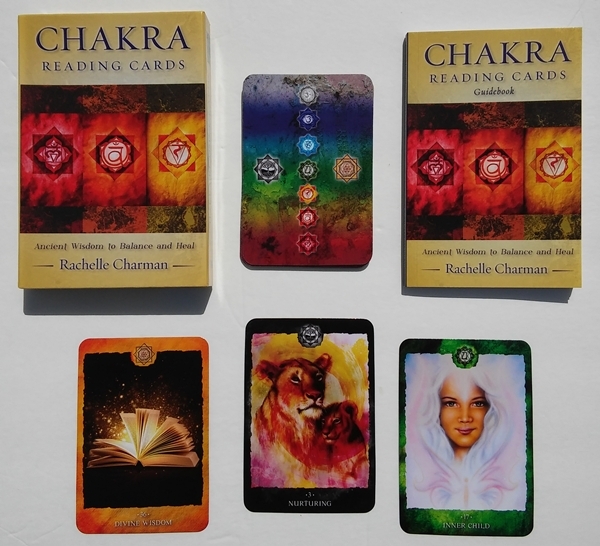 Deck: Chakra Reading Cards by Rachelle Charman, published by Rockpool Publishing.